Dezeen promotion: BD Barcelona Design has enlisted Spanish designers Curro Claret and Ramón Ubeda for a new product range made from the brand's own discards. BD Barcelona Design – whose prestigious catalogue has featured designs from the Campana brothers and Jamie Hayón as well as Salvador Dalí and Antoni Gaudí – launched the REmix project in a bid to combat wastefulness in the design industry. The furniture brand developed the range after discovering unused Cristian Cirici-designed brass door handles and knobs in its warehouse that had remained untouched since the 80s, when it changed direction to focus on other markets. This led to the first instalment, titled REmix Vol 1 – a set of candle holders made by Claret using the doorknobs. 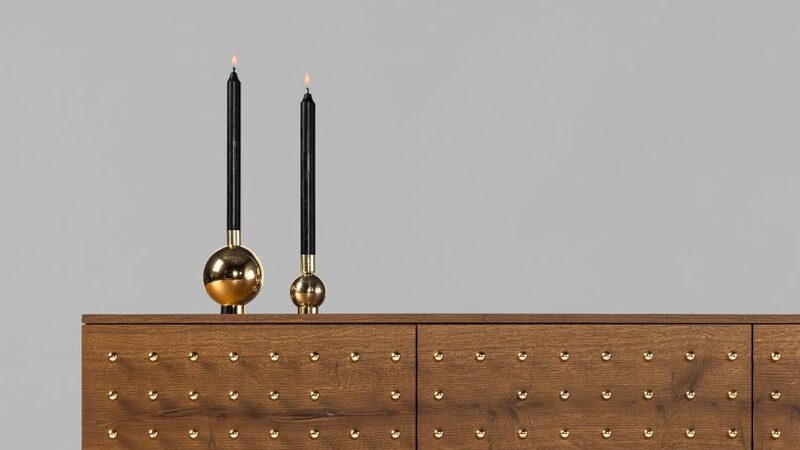 The limited-edition candle holders are made of polished varnished brass handles and a large coated aluminium ball, which is covered with a brass coat. REmix Vol 2 is a series of cabinets, developed by Úbeda and the technical team. The cabinets are crafted from natural stained dark oak, decorated with accessories in polished varnished brass. They stand on brass-coated aluminium legs. The series will be added to as the collection develops in the future. "Cooking with leftovers is something as old as necessary and nevertheless creative," said the brand. "In our recipe book exist memorable dishes that are prepared with hard bread from the previous day and chicken leftovers from Sunday's roast." "Company warehouses in the design sector also accumulate leftovers," the company continued. "Generally, these are loose pieces or components of furniture parts that have been forgotten about and put in a drawer, because there was once an excess in fabrication or have been discontinued." "It loses all its value but continues taking up space and ends up destroyed. BD has accumulated outdated materials as well, but before considering destroying it we thought we could give it a second chance." BD Barcelona Design hopes the project will inspire other brands to recuperate and reuse discarded materials from their own storage spaces.